C TIMe Switchgear Timer – Crest Test Systems Pvt. Ltd. Measuring contact timings is useful for finding the contact bounces and non-simultaneity of contacts. This helps in finding the possible electrical or mechanical defects in the circuit breaker contacts. Timing analysis also make it possible to detect incorrect mechanical adjustments and wear phenomena of the circuit breaker by measuring the differences between the fastest and slowest phases. 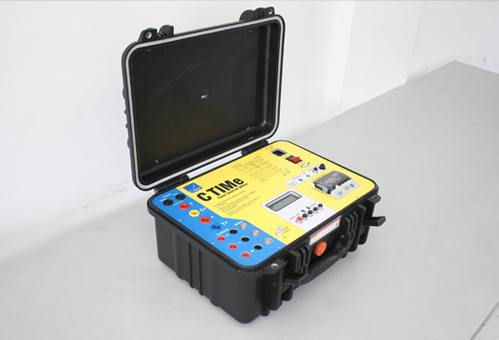 C TIMe is a portable timer that has been specially designed for accurately measuring the closing, opening, C-O times, and motor current duration of all types of circuit breakers, contactors, and load break switches. It has a rugged construction that allows it to be operated under hostile EHV switchyard conditions and offers reliable measurements for periodic maintenance and inspection. Typically, C TIMe is used for testing 3-pole Breakers from 6.6 kV to 440 kV, classical MOCBs, modern SF6 Breakers, gang and individually operated Breakers, and many more.